Desarrollado desde marzo hasta octubre de 1942, los planes eran que la producción en serie comenzara en abril de 1943, pero el proyecto se abandonó antes de la construcción del primer prototipo. The VK 16.02 Leopard is less maneuverable than the Pz.Kpfw. II Luchs, but it has more than twice as much effective armor, a top turret that works well for circling and a much longer signal range. Due to the unusually thick frontal armour and heavy weight, the Leopard can bounce a surprising number of shots and can also be used to ram other tanks and especially arty if there's not enough time to shoot them apart. In update 0.8.4, this tank, along with the Pz.Kpfw. II Luchs and the VK 28.01, has been moved up a tier and has been rebalanced. Due to the small turret size, it has better gun depression on the sides than the front and rear, meaning you should position the tank at an angle when on slopes. Low damage output for the 3cm cannon. Its top speed of 60 km/h is easily achieved with the upgraded 585hp engine, making it an impossible target to hit for players who auto-aim, and a harder target for more experienced players too. With its 700m upgraded radio range, it ensures that targets will be relayed to artillery and teammates. While its top speed is 4 km/h slower than the A-20, it turns much faster at high speeds, so it makes up for the slight lack of speed with more maneuverability. Its acceleration and turning speeds have been increased compared to update 8.3, making it turn very quickly, even rivalling the lightning-quick Pz.Kpfw. III/IV and M4A3E8 Sherman. It has a powerful 50mm gun, which can easily destroy any artillery within a minute, and a 3cm autocannon with surprisingly high penetration, allowing it to penetrate the sides of most enemy Tier 7 tanks with ease. The leopard is much harder to kill with lower tier tanks than the other scouts. It offers a great amount of armor and a large HP pool, but the armor is irrelevant against most high-penetration, large-caliber cannons at its matchmaking tier Due to its weight and speed, ramming enemy artillery and scouts might be a viable strategy in 1 vs 1 engagements, much like the later VK 2801. The leopard is not as maneuverable as the T-50, but it can definitely give one a run for their money in a 1v1 fight as the T-50's guns can't reliably penetrate the Leopard's front. It is also a better light tank and scout when compared with the Pz.Kpfw. 38 (t) n.A. and the M5 Stuart. Since the 8.4 update this Tank has seen a noticeable change, no longer is it a difficult tank to drive, it has seen its hit points bolstered up to 440hp, and has been equipped with a new autocannon, which is quite capable of penetrating the sides and rear of higher tier tanks at close range, this tanks acceleration and maneuverability is now just behind that of the T-50, and in a face to face battle it will win easily. When fighting on slopes, it is recommended to position your hull at an angle as you have better gun depression on the sides than the front and rear. Off-Road Driving - This skill will help the Leopard maintain higher speeds instead of slowing way down with every turn or slight incline. It seems to be particularly useful for the Leopard compared with other scouts. It seems to help more than Clutch Braking since more speed is maintained through the turn. Repair - A tracked scout is a dead scout, then again it will be quite hard to gain speed and escape after a full stop. Camouflage - Active even when moving, this skill allow you to remain undetected longer, decreasing the risk of being shot at as long as you don't ram people. Controlled collision - While it does have a decent gun, it bleeds speed in turns. Not as much as its bigger brother, the VK2801, but sometimes ramming enemies may be preferred over trying to circle them. Adding Enhanced Torsion Bars 1 t Class will make the tank harder to de-track. This also gives the tracks a significant increase in the chance to remain fully intact, even when going over a cliff or steep bank. Using a Spall Liner will make it less vulnerable to splash damage from enemy arty trying to defend itself, and decreases ramming damage done to your own vehicle when ramming or rammed by an enemy vehicle, usually scouts and arty. Just take note of the added weight. The Leopard should only use armor-piercing (AP) projectiles. This will easily destroy light tanks, will provide an opportunity to engage in battle with the medium tanks, and even have a good chance to penetrate high tier self-propelled guns. High-explosive projectiles (HE) are useless against tanks at high levels (considering the Leopard's low caliber gun). The FuG 7 radio carries over from the Luchs, as does the 2 cm Flak 38 L/112 auto-cannon. 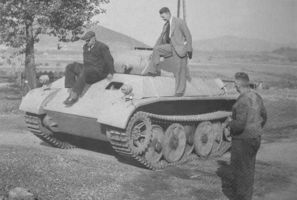 First you need to research the Leopardketten Ausf. B suspension. Without it, you will not be able to put other modules on, and the improved ride characteristics are valuable. Then research the Maybach HL 120 TRM and 157 P engines. They allow the tank to reach maximum speed, and play with them will be much more comfortable, as well as making the Leopard a true scout. Research the KwK 39 L/60 gun, which will make Leopard a formidable predator. After researching the FuG Spr. A radio, the Leopard will be completely transformed into a scout. Artillery will be able to see the targets you light up from across the map. Now get the 3cm M.K. 103, which will give you the firepower to destroy many targets within seconds as well as greater penetration. Since 1941, plans were made for the development of a new reconnaissance tank based on the PzKpfw II Ausf J (VK 1601). In March of 1942, MIAG and Daimler-Benz received orders to build a fast (medium/heavy) reconnaissance tank, designed to operate under heavy combat conditions - Gefechtsaufklarung. MIAG was to construct the chassis, while Daimler-Benz was to construct the turret. Both were to be designed and ready for production by October of 1942. The main purpose of this vehicle was to be at HQ tank-platoons in Panzer units. 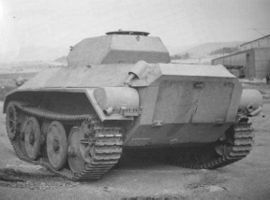 Two versions were proposed; the "Leopard (leicht)" lightly armored fast version (18ton) and the "Leopard (schwer)" heavily armored unit (26ton). The light version was quickly dropped in the Summer of 1942, in favor of the heavier one. Design of the VK 1602, named Leopard, was based on the development of previous projects such as the PzKpfw II Ausf J (VK 1601) and PzKpfw II Ausf M (VK 1301). Its hull was similar to that of the Pz.Kpfw. II Ausf J (VK 1601), but was largely influenced by the Pz.Kpfw. V Panther, which was still being developed at the time. Its suspension was made up of interleaved road wheels similar to the PzKpfw II Ausf L - Luchs and the Tiger. It was planned that the Leopard would eventually replace the lighter PanzerSpahwagen II Ausf L Luchs - Sd.Kfz.123 (VK 1303). A mock-up was ready in May/June of 1942, and the first prototype was to be finished by the September 1st of 1942. Full scale production was to start in April of 1943. Leopard’s armament consisted of 50mm KwK 39/1 L/60s and a 7.92mm MG34/42 in a newly designed small turret. It was also planned to use the 75mm KwK 41 gun. VK 1602s were heavily armored and had well sloped frontal armor (influenced by the Panther). The Leopard was to be powered by Maybach's HL157P engine with a total power 550hp: allowing the VK 1602 to travel at a maximum speed of 50-60km/h. In order to improve its cross-country ability, 350mm wide tracks were used. It was to be operated by a crew of four men. "Panzerprogramm 41" made provisions to build 339 Leopards (105 by December 1943 and a further 150 by mid 1944). The start of production was previously planned for April of 1943, but the entire production was cancelled in January of 1943, when the first prototype was still incomplete. The reason for cancellation was its heavy weight and lack of heavy armament, which made the vehicle vulnerable to enemy tanks. Additionally, development of the Leopard, being so similar to the Panther, became a hard sell after it was pointed out that reconnaissance Panthers could be developed and produced at a lower cost. This concept was continued in the Daimler-Benz’s design of improved VK 2801, but this was never completed and the entire program was cancelled on May 8th of 1944. The vehicle was to be powered by Maybach's HL230 (700hp), but Daimler-Benz engines were considered as well. Finally, the task of combat reconnaissance was taken by the PzKpfw V Panther and PzKpfw IV. 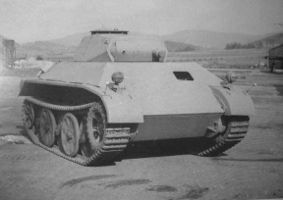 Eventually, Leopard’s turret, with its armament, was later utilized on the heavy armored car Sd.Kfz.234/2 Puma. Rheinmetall also planned to utilize the Leopard’s chassis as base for a 105mm leFH howitzer carrier, designated Waffentrager Leopard, and Sturmgeschuetz auf Leopard (L/70) assault gun/tank destroyer armed with the Panther’s main gun (the 75mm KwK L/70, but only wooden mock-ups were made. There was a similar project to use the Leopard as a base for the Flakpanzer armed with either the 20mm Flakvierling or 37mm Flak 36 gun, but it was never realized.